When: Tuesday, February 11, 2014 6:30 p.m. The tale of Susan Vance (Hepburn) and her infatuation with paleontologist, David Huxley (Grant) is one that is fast-moving, hilarious, and exhausting! The dialogue is snappy and spirited, as are the antics of Hepburn and Grant, who get to show off their talents for physical comedy. Director Howard Hawks initially considered Carole Lombard, but Hepburn was eventually given the female lead. The male lead was offered to Robert Montgomery, Fredric March and Ray Milland. They all turned it down. Grant having gained new-found fame after his star turn in The Awful Truth, was reluctant to play a scientist, but eventually used the opportunity to renegotiate his non-exclusive contract with RKO, the studio producing the film (Grant made more money than top-billed Hepburn). Having had a run of several disappointing pictures, while under contract to RKO, Hepburn’s movie career was in decline. Before Bringing Up Baby’s release, Hepburn was declared box-office poison by the Independent Theatre Owners of America. 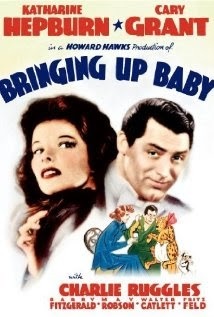 After Baby’s release, Hepburn returned to the stage and wouldn’t make a movie for two whole years. Grant on the other hand was moving up in the world and was a fan favorite. In 1940, Hepburn triumphantly returned to the screen in The Philadelphia Story, costarring Grant and James Stewart. Backstory: Besides leads, Hepburn and Grant, Baby is populated with a wonderful collection of character actors, including Charlie Ruggles, May Robson, Walter Catlett, and Barry Fitzgerald. And Skippy the dog, who had supporting roles in The Thin Man Movies and The Awful Truth, barks his way through another classic film. The Chicago Film Club is for classic movie fans. Once a month we screen a classic film and have a brief discussion afterward. For more information, including how to join (it’s free), click here.To purchase your ticket in advance, click here. The Venue 1550 is easily accessible by the CTA. Please visit Transit Chicago for more information on transportation options.